Using a wheelchair is not the same as sitting in a regular chair. Able-bodied people, even in desk jobs where they sit all day, do not experience sitting in the same way that wheelchair users do. Able-bodied people get up periodically, if only to use the restroom, go to the coffee machine, or stretch their legs. Further, people with the use and control of their muscles shift their weight while sitting, something wheelchair users may not be able to do. A wheelchair user may be in the same position all day, something with consequences for blood flow, pressure sore formation, and general discomfort. A "bad fit" in a wheelchair can result in breakdown in tissue, urinary tract infection, unneeded atrophy of muscles, and fatigue. The size of the chair is an important factor in matching the equipment with the user. Height, weight, and muscular mobility play a part in determining the optimal seat length, back length, and angle of repose. Factors that should be considered in matching a user to a wheelchair include the time the person typically spends in the chair every day, the terrain they typically navigate, and what type of automobile is used by the person. There are many types of chairs, and the big manufacturers all make many models. Selection criteria includes diagnosis and prognosis of the user, his or her communication ability and cognitive status, whether he or she has problems perceiving surroundings, and whether edema is present. Wheelchair propulsion efficiencies are typically low, in the range of 2% to 10%. Mark's Standard Handbook of Mechanical Engineering says the top efficiency for a manual chair is at half the maximum muscle force and a quarter of the maximum muscle speed. From an engineering efficient standpoint, a manual wheelchair is inefficient. Bicycles are more efficient. Chair users therefore must put up with high physical strain from short-duration peak loads. 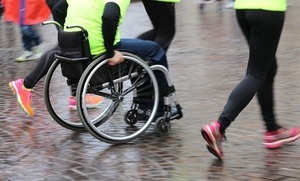 A report from the Department of Veterans Affairs stated that "crank- and lever-propelled wheelchairs appear to be less straining forms of locomotion." Manufacturers have replaced the wood, cast iron and wicker of early wheelchairs with steel, aluminum, rubber, and plastic. Modern chairs are therefore much lighter: in fact, some lightweight aluminium transit wheelchairs weigh as little as 18 lbs. Aluminum, however, is less flexible and more brittle than steel. Wheelchair makers must therefore use comparatively large tubing to ensure a chair’s strength. Steel is strong, widely available and reasonably priced. And it need not be too heavy: standard manual wheelchairs made of steel weigh between 20 and 40 lbs. Sports wheelchairs are built to be light, robust and flexible and are made from composite materials such as titanium, carbon fiber and chrome alloy. Designers have many ideas, but whether they will come to market is not clear. Some ideas for future chairs include four-wheel drive, remote control operation, gyroscopic sensors to maintain balance, and a sensor that enables a wheelchair to automatically avoid obstacles in its path. Another proposal is a wireless navigation system that plans a wheelchair’s route. 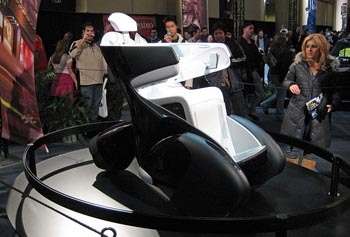 If technology and production techniques can make such features viable, there is little doubt that the wheelchair user of the future will have greater independence than today’s do. by Flickr member Squiggle. Used under Creative Common License.